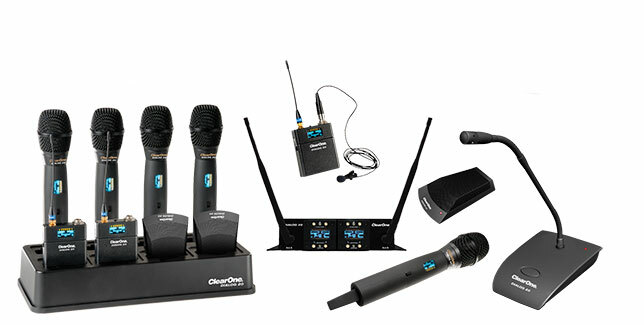 ClearOne is launching a new compact, two-channel wireless microphone system designed for classrooms and other small venues. Debuting at the InfoComm 2016 conference (taking place this week in Las Vegas), the DIALOG 20 uses “adaptive frequency-hopping spread spectrum technology within the 2.4 GHz unlicensed spectrum” to help avoid problems of interference. It also uses 128-bit AES encryption to help secure the wireless transmission. The new system offers four transmitter options, according to ClearOne: handheld, belt-pack, gooseneck podium, and tabletop version with programmable buttons. “Each of the microphone transmitters has additional options suitable for any application. The podium has six-, 12-, and 18-inch gooseneck options. The handheld offers cardioid, super-cardioid, and hyper-cardioid heads. The belt-pack has clip-on and headset versions, while the tabletop boundary transmitter offers omni and cardioid mics,” according to the company. The receiver can be powered using micro-USB or power over Ethernet and can be rack-mounted or mounted on a wall or ceiling. They work with any mixer but interface natively with ClearOne's new CONVERGE Pro 2 and Beamforming Microphone Array 2, both of which are also debuting at InfoComm. They can be daisychained to up to three DIALOG 20 receivers, according to the company. ClearOne is exhibiting in booth N1837.